The Dragon Blood Tree is an iconic tree indigenous to the Socotra archipelago. It is also known as Socotra dragon tree as it is most commonly found on the limestone plateau of the island. They have a very slow growth rate. The scientific name for this tree is Dracaena Cinnabari belonging to the Asparagaceae family. It was first described in the 1830’s by Lieutenant Wellsted of the East India Company. Large groups of these trees are most commonly found in foggy and cloudy regions so the leaves can trap the moisture from the air and supply it to the roots. These trees have single trunk and multiple branches that gives an umbrella shaped crown. The crowns of the trees make them look like giant mushrooms. They grow to an average height of 32 feet. These branches follow dichotomous branching which means each branch gets divided in two. This beautiful and evergreen tree can live up to 650 long years if provided optimal conditions. This tree has got this name because of the famous red resin which is exuded from its bark after bounding. It is the only plant in the Dracaena genus to form dense woodlands. This tree has long, thin, and stiff leaves with small fragrant flowers which are white or green in color. Dragon Blood Trees start blooming in February. It has fruits in the form of small berries. These orange-colored berries take 5 to 6 months to completely mature and are filled with 1 to 3 seeds. Declan, Tobin. " 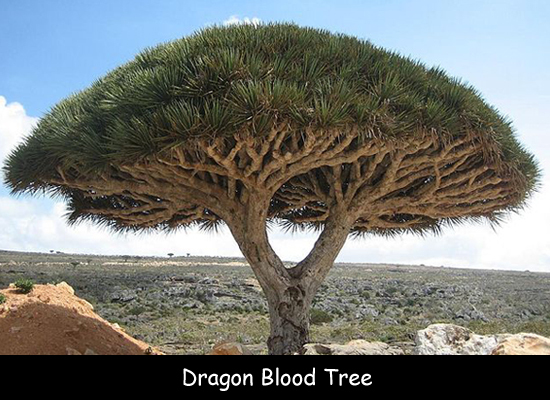 Fun Facts for Kids about Dragon Blood Tree ." Easy Science for Kids, Apr 2019. Web. 18 Apr 2019. < https://easyscienceforkids.com/dragon-blood-tree/ >.